Description: This intelligently planned release gives us early, middle and late-period Eisler in reverse order and beginning with something which will surprise those of you who think of the composer only as an agit-prop socialist: the Ernste Gesänge of 1962 are a response to the shocking revelations of Stalinist atrocities in the USSR and Eisler reverts to a powerful, direct style tinged with Mahlerian late Romanticism as he expresses his grief, outrage and anger. The sardonic wit and sarcasm of the so-called Hollywood Songbook of the 1940s is represented by 14 Lieder while the 1923 op. 1 sonata, freely atonal and brimming with ideas, complexity and energy, stands between the Lieder and two songs from incidental music for a play and one from a film of the 1930s which bring this enlightening release to an end. German-English texts. 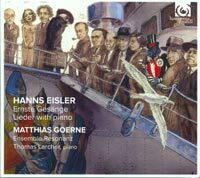 Matthias Goerne (baritone), Thomas Larcher (piano), Ensemble Resonanz.